Crystal is 6 cm long. What better time to retreat from the coolness of our adit at the Orchard quarry and start work above ground at Mt. Mica than the dog days of summer. So on July 26 we began moving our equipment from the Orchard to Mt. Mica only 4 miles away. As we prepared to move over to Mt. Mica, I especially felt as if we were about to have a rendezvous with Mae West. Mt. Mica has certainly had its way with many suitors over the last 187 years since it first smiled on Hamlin and Holmes in 1820. Would the hill smile on us...we were certainly 'glad to' be there? The first thing we decided to do was to pump water from the Plumbago ' big pond' for 2 hours to see how quickly the level would drop. Before so doing, and after we had heard much concerning the arsenic level in the water, we tested it for Arsenic. Our several tests results showed the water contained an average of only 5µg/L arsenic. The new EPA limit for drinking water is 50µg/L. The frogs breast stroking in the pond did not seem worried either...end of the arsenic fable. To perform our pumping test we had laid out our 3" hose between the dump piles on the western end of the pond and on the up dip side. As we completed our trial and as we were picking up the hose, Richard noticed the flow had exposed some attractive pegmatite containing smoky quartz, very large schorls and green beryl. As my preference was not to start work where others had left off , this exposure seemed like a good spot to investigate. Richard and I spent the next 10 days clearing off the old dumps piled high on the pegmatite ( not the Merrill dumps). Once we had cleaned the pegmatite along a line even with the up dip side of the pond, we could see that the garnet line, the point below which experience has taught those who mined at Mt. Mica nothing of note is to be found, was exposed on the surface. We were able to trace the pegmatite for 110' from the western edge of the pond to the west before it graded into thin broken blocks. As we cleaned eastward and slightly down dip we encountered schist but it was so decomposed that it could be easily dug off the dipping pegmatite. Once the digging was somewhat along, we used some of the pond water to wash the peg down. While doing this washing, we exposed a large area of peg containing cleavelandite about 60' from the pond and on the up dip side. After working 6 years at the Orchard without seeing a single blade of cleavelandite, its appearance was encouraging. Our washing also revealed a couple of places that looked like pocket....again right on the surface. Could this be deja-vue of 1820? Mary, who was working with us, set to the task of exploring one of these depressions. After only few minutes she started finding very dark root beer colored smoky quartz crystals. Continuing to probe this now official pocket #1 of the Coromoto era (MMP#1 :-)) she pulled out this amazing 8" scepter. 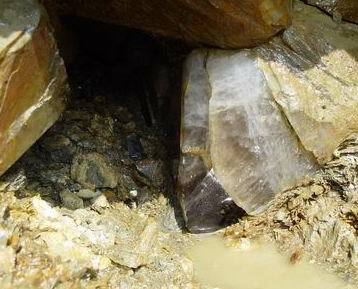 Once completely dug out, the pocket contained many quartz crystals and very large mica books and was rimmed with cleavelandite but contained no other minerals. Altogether not too bad considering we had not yet drilled a single hole. Suspecting this surface feature might portend something of interest below, we placed our bench, once we had mined close to it, a full 2' in front of the roll. In addition we shot just 2 of the 7 holes we had drilled along the roll. Having read much about Mt. Mica's pockets and the fact they seemed often to be filled with a gray sand like material, my hopes soared when a saw a layer of gray sand in a narrow space. After a week of mining mud, I had learned at least some off the material not to dig. Carefully cleaning away some of gray sand exposed a dark smoky quartz face....no, definitely not a mud seam. As we continued to remove more sand and other material a very large smoky quartz face gradually emerged. The dimensions of the pocket were enlarging as well. 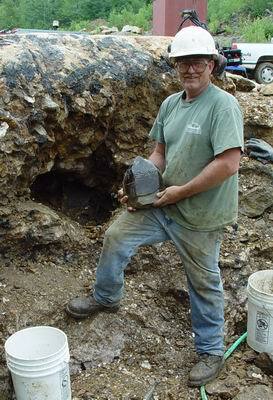 Frank Perham came by to help us excavate this new find. Cleaning the pocket required two days. MMP#2 like MMP#1 produced no tourmaline but it did have another mineral of interest. 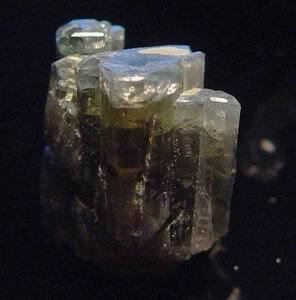 At first thought to be ' altered tourmaline' by some, Ray Woodman's identification as cabonate-fluorapatite seems to be the correct one. 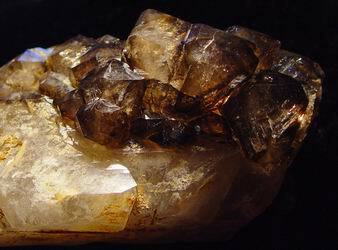 This mineral formed on many of the smoky quartz crystal terminations. Several nice groups were in the pocket. The picture of Richard holding a nice smoky bears testament to the quality of the 'pocket digging' experience. 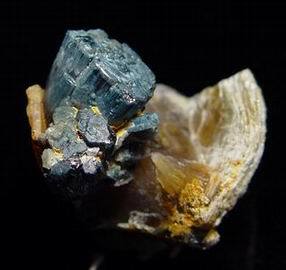 Blue carbonate-fluorapatite on quartz crystal in pocket MMP#2 The back wall of pocket #2. The roots indicate its proximity to the surface. Note dark smoky point. Although Richard and I were fairly proficient at being able to read the pegmatite 'signs' at the Orchard, at Mt. Mica we were still using training wheels. With Franks Perham's valuable guidance our skill level was improving. This lack of intimate knowledge of the pegmatite was another reason I wanted to work in from the edge. As we worked the roll, it became clear it had taken a southeasterly strike within the pegmatite. The next bench eastward exposed pockets 3 and 4. They were 10' down dip of MMP#2 and 6 feet to the east. These two pockets were completely filled with yellow/white kaolin. 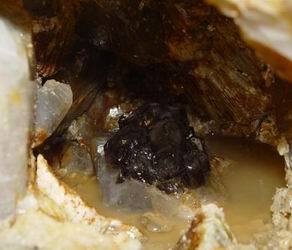 Both contained smoky quartz crystals and were rimmed by large mica books. The floor of 3 had a series of mica books whose tips alone protruded into the pocket creating a curious worm like appearance (see photo at the right). 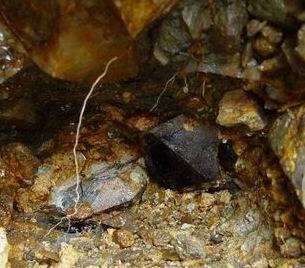 4 produced an another exceptional smoky quartz specimen( see photo at left). Again, no lithium minerals were found. Frank remarked that dark smokies were atypical of what he had seen come from Mt. Mica. The apatites we were continuing to find were unusual too. As we continued to mine eastward towards the 'Big Pond' we again began pushing the exposure to the south ( down dip). Unlike the up dip portion of the pegmatite, the down dip section is relatively thin varying from 5 to 6 feet. Initially, as we worked down dip, the characteristic of the pegmatite was similar to the far western end as there was only quartz, mica books, montmorillonite stained spars and a few beryls. 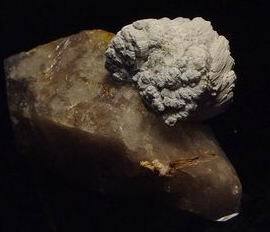 However, as the advance pushed more to the south and east very white cleavelandite appeared abundantly mixed in with dark smoky quartz. However, so far in this section, we have found a only few small vugs with quartz crystals and cleavelandite. Pockets 5 and 6 appeared on the far up dip side of our workings. 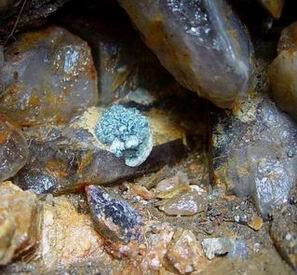 Like 1 and 2, they were associated with cleavelandite exposed at the surface of the pegmatite. Our first clue to their existence came as I scraped the top of the pegmatite with the excavator bucket. A light pass to remove some loose rock produced an explosion of hand sized and larger muscovite books. We had learned by now that these micas are pretty reliable pocket indicator. Closer examination of the spot where the micas were revealed an extended and flattened pocket whose dimensions were approximately 1.5m x 1 m x .3m. The space was filled with many quartz crystals some of which contained curious white rod like inclusions. As pocket 5 was essentially on the surface, it was filled with an abundance of earth and glacial till and organic detritus of all kinds. We worked intermittently cleaning this area out over 2 days. Late on the 2nd day Richard and I found a section of the pocket filled with yellow and white kaolin. This was very similar to the material that filled MMP#3 and 4. As we carefully washed this kaolin away, Richard lifted out a small mass of muscovite and cookeite. 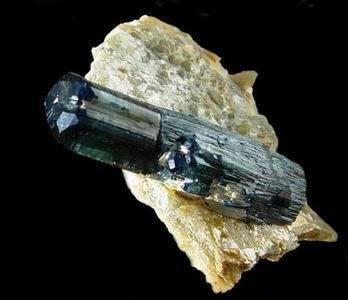 Attached to the back was the the main section of the amazing blue crystal pictured at the top of the page. A little more washing exposed the termination. Unfortunately, another few hours of careful searching produced nothing else. Slightly down dip from MMP#5 we opened number 6. 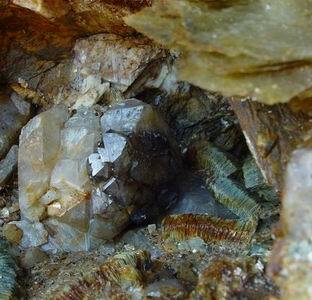 This pocket, the size of a bushel basket, seemed only to contain ordinary quartz crystals. We did diligently scoop all of the material into 5 gallon buckets just in case. 6 was tucked back under the ledge in such a way that it was impossible to see the roof. To continue advancing our working face we would have to remove the ledge above and in front of the pocket. We decide to remove the toe in front first. After the blast we checked the results of our work. Laying on the floor of empty pocket # 6 was something that looked like a piece of our blue shop towels. No, this wasn't a shop towel, it was an electric blue apatite group that the blast had dislodged from the roof. The group is pictured below. Note: The history of Mt. Mica has been well documented over the years. The reader is referred to an excellent article on Mt. Mica and other Maine tourmaline localities titled ' Maine Tourmaline' by Dr. Carl Francis in 'The Mineralogical Record', volume 16, September-October, 1985. Volume 2 of the ' Mineralogy of Maine' by Vandall King has several historical articles on the locality . Note 2: There is a very famous picture taken at Mt Mica, probably during the Hamlin Period 1868-1890, showing 2 farmers and many of the pockets found to that date marked by sticks with tags. The Pepsi bottle photo is reminiscent of that picture.